Pets have a tough time when cold weather sets in, so knowing how to provide proper care for dogs outside in winter's frosty conditions is highly important. The American Veterinary Medical Association recommends that pets live indoors, but when your canine companion needs to spend time outdoors during the winter, these tips can help keep him happy, safe, and healthy. Before the mercury drops, you can take some steps to prepare your dog for the change in seasons. The American Veterinary Medical Association, as well as the American Animal Hospital Association, recommend that pets have an annual examination. This can help to identify problems that can be exacerbated by cold weather, including arthritis. If necessary, your vet can prescribe medications to help with symptoms that can worsen in the cold. Puppies and geriatric dogs can be more susceptible to dangers from the cold. Pets with diabetes, heart disease, endocrine disorders, or kidney disease can have greater difficulty regulating their body temperature and are also at increased risk. Breeds with long hair or thick coats will generally be more tolerant of the cold when compared to short-haired dogs. According to the ASPCA, your pet's fur should not be clipped short during the winter, and many breeds of dog will benefit from a dog sweater or coat. While no dog should be kept outdoors in sub-zero temperatures, in some climates a pet can still spend a great deal of time outside if proper precautions are taken. The American Red Cross has several tips to help keep your outdoor dog warm during winter weather and snow storms. Consider using a heated water bowl to keep your pet's water from freezing. Failing this, a floating ball will help to stop ice forming across the entire surface. Check to make sure that ice or snow accumulation has not blocked your dog's access to food, water, or other needs. The cold weather is often accompanied by strong winds, so it is vitally important that a dog kennel provides adequate shelter. A well-insulated dog house should be sturdy, dry, and draft-free. The flooring should be raised a few inches off the ground and covered with cedar shavings or straw. The shelter should be large enough for your pet to turn around, but small enough to retain your pet's body heat. Shield the doorway with waterproof burlap or heavy plastic. Avoid the use of radiating heaters or heated pet mats due to the risk of fire and burns. Bring your dog inside when the wind chill drops below 0°F degrees. When a dog gets cold, he uses his own energy supply to keep warm. According to Washington State University College of Veterinary Medicine, you can give 10 to 15 percent more food to your dog to help provide extra calories. Alternatively, added fat can help to provide those calories, but could also cause diarrhea or gastrointestinal disturbances. 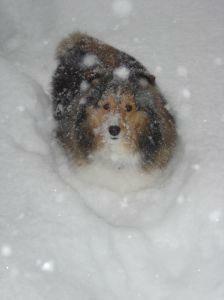 If a dog is allowed to play outside, monitor him closely and bring him in if he starts to shiver or whine. Help arthritic or elderly pets when they are faced with stairs or ice. Slips and falls are more common, as with people. Limit the length of your pet's walk in cold temperatures. When it drops below freezing, your pet should spend no more than 10 to 15 minutes outdoors. Clear snow and ice to help encourage small dogs to eliminate outside. Small breeds can be trained to urinate and defecate on paper or diaper-like pads indoors when weather is too extreme. Avoid outdoor trips completely when the temperature or wind chill reaches 0°F. Even indoors, your pet may feel the cold. Make sure that your dog's favorite bed is in a location free from drafts. Pet clothing can help provide some additional insulation. Make sure that you dry any wet clothing completely before dressing up your pooch. Protective boots are also available. Make sure that everything fits well and that your dog is accustomed to wearing it. Sometimes the signs of frostbite are not immediately visible and can develop days after the exposure. Treatment include gentle and gradual rewarming with warm water of 104 to 108 degrees. Dry the area afterwards and keep the pet warm. Seek veterinary care as soon as possible to try to prevent complications such as infection. First aid can be provided if you are concerned that your dog is suffering from hypothermia. Gradual rewarming with a blanket or hot water bottles is safest. Seek veterinary care if you believe that your dog is suffering from severe hypothermia, or if your pet is showing symptoms other than shivering or mild lethargy. While a person should know better than to run out onto a frozen pond, your dog won't realize the potential danger. The Massachusetts Emergency Management Agency recommends that dogs be kept on a leash around bodies of water in the winter. Pets that run free can also become disoriented and lost in a snowy environment because they won't be able to recognize familiar landmarks. Watch out for your dog's pads and feet in wintertime as well. According to the ASPCA, some of the rock salt used as an ice melter can be irritating to your dog's feet. Other dangers, such as puddles of the extremely dangerous toxin, antifreeze, can also end up on your dog's feet and fur. Wipe your pet's feet an underside off with a warm and wet towel after he comes back inside from the snow. Ice balls can accumulate on the fur of the feet and can become painful. The snow can also mask dangers such as sharp ice or metal. Lacerations of the feet and pads are more common in the winter months and should prompt a veterinary visit. Providing proper care for dogs outside in winter's worst weather will ensure these pets make it safely through the season until spring returns once again. With attention to the temperature outside, vigilance, and a few precautions, you can keep your indoor or outdoor dog stays safe from injuries, frostbite, or hypothermia.